Copyright 2010, Kate Hansen, All Rights reserved. 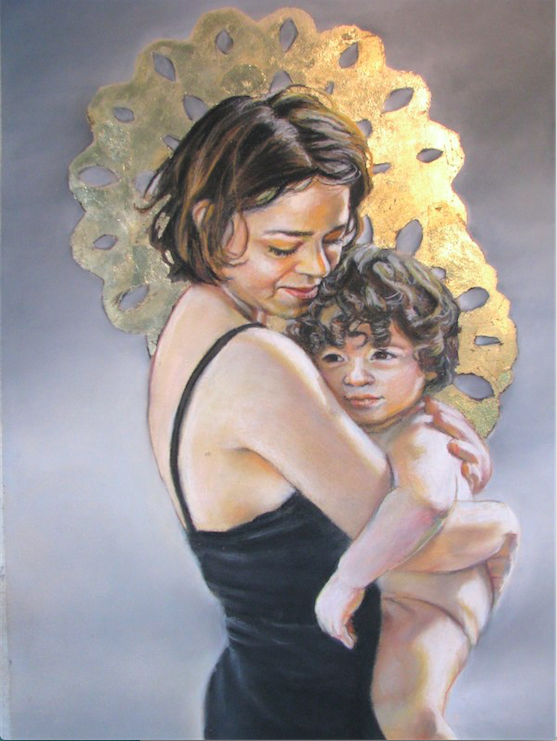 In this beautiful image, part of Canadian artist Kate Hansen’s Madonna and Child Project, Hansen celebrates the bond between mothers and children. Utilizing the sacred symbol of halos to adorn the crowns of her two figures, Hansen both appreciates our cultural understanding of the Madonna archetype, while also emphasizing a broader humanistic divinity manifest in the mother-child relationship. Hansen’s use of conte crayon adds a soft and airy quality to the figures’ bodies, a softness that is further emphasized by the light gray tones of the background. Balancing strength and delicacy in form, the depicted mother holds up her child while looking down deeply at him, and he rests solidly against her chest gazing into the distance. For the pregnant woman, mothering may seem far off, but envisioning the child as already born and in one’s arms can be highly beneficial during labor and birth, as well as during the days before labor commences. These types of visualizations remind the pregnant woman that her baby will in short time emerge from her body and exist as a separate entity, something that sometimes strangely seems impossible during pregnancy. The effect of these visualizations is calming, and I have written about them here and here (including how I used them during my pregnancies). I have previously written about using Hansen’s work in the visualization of birth here. She is also one of the artists featured in my academic publications (see Demeter Press and Routledge, forthcoming). Kate Hansen has an academic and studio background in art. She currently resides with her family in Courtenay on Vancouver Island in British Columbia, Canada, and has exhibited her work in Chicago, Toronto and in Courtenay. She may be contacted or more of her artwork may be seen through her website.